Jerusalem, October 6, 2016 — Staphylococcal and streptococcal infections affect millions of individuals each year. They are a leading cause of sepsis and account for many cases of pneumonia and post-surgical infections. Despite the urgency of this situation, the antibiotic development pipeline is dwindling and multi-drug resistance is rampant, rendering the classical one-bug, one-drug approach obsolete. The ability of staphylococcal and streptococcal bacteria to cause disease is due to numerous virulence factors, among which a group called Superantigens play a prominent role. Several dozen superantigens are highly lethal in humans and are critical contributors to sepsis and progression to toxic shock. While the inflammatory immune response is essential to protecting humans against viruses and bacteria, superantigen toxins cause an exaggerated response — called an “immune storm” — that can do a great deal of damage in the body and can result in multiple organ failure. Even with currently available treatment strategies, most of these diseases have high mortality rates. Complicating treatment of these bacterial infections are multi-drug resistant strains. Now, in a landmark research paper culminating 20 years of scientific investigation, researchers at The Hebrew University of Jerusalem show for the first time how bacterial superantigen toxins work, and how antagonists they designed can block toxin action and save lives. In the paper, published in Proceedings of the National Academy of Sciences (PNAS) , the researchers describe a novel host-oriented therapeutic approach for preventing lethal immune responses. With major implications for medicine, the novel approach is both broad-acting and impervious to bacterial antibiotic resistance. A normal immune response is mediated by an antigen through the joining of cells through well-known receptors on their surface, a process that is helped by the so-called “costimulatory” receptors. 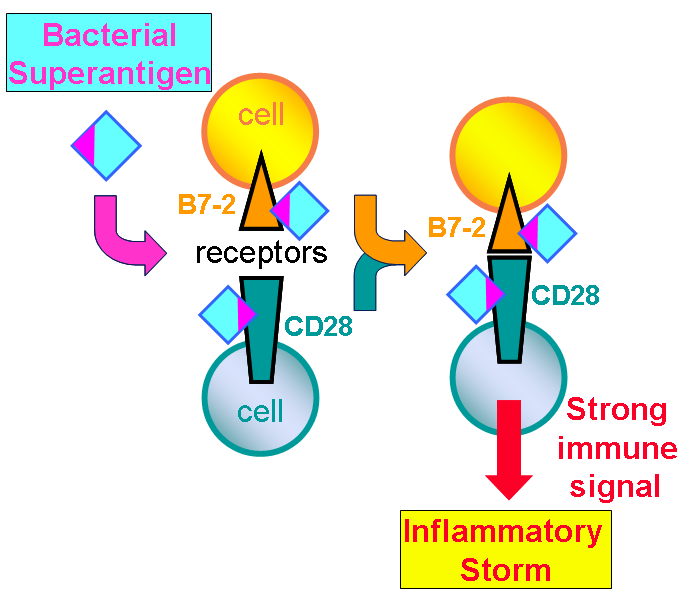 Unexpectedly, the superantigen strongly promotes the interaction between the major costimulatory receptors, B7-2 and CD28, and this turns out to be critical for its ability to elicit an immune storm. Formation of the costimulatory axis was already known to be important for a full immune response, but the present findings propel this axis to the foreground as a key bottleneck. It was already shown by the same team that a superantigen must bind CD28 in order to do its harm but the mechanism underlying this need remained obscure. The researchers now show that in order to enhance B7-2/CD28 receptor engagement, superantigen molecules bind directly to both receptors. By binding not only CD28 but also its coligand B7-2 directly, superantigens potently enhance the B7-2/CD28 interaction, inducing thereby T-cell hyperactivation. 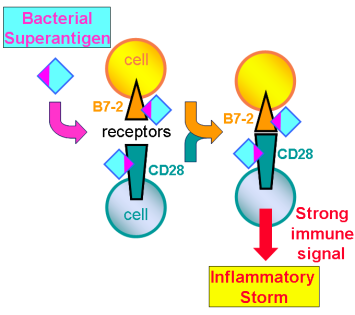 Bacterial superantigens thus induce the pathogenic immune storm by strongly enhancing formation of the B7-2/CD28 costimulatory axis. Insight into this mechanism led the researchers to design new peptides — snippets of the human B7-2 receptor protein — that powerfully block the binding of a superantigen to its costimulatory receptor targets, and thereby protect against lethal toxic shock, as they showed in animals. Each peptide mimics a small part of the site in B7-2 where the superantigen must bind. Acting as a decoy of the intact receptor, such a peptide will bind the superantigen toxin and thereby block its access to the receptor needed for toxicity. “The strategy of using peptides that mimic regions of a human immune receptor, to put the brakes on the excessive inflammatory response triggered by superantigen toxins, is a host-oriented strategy that is broadly effective against the diverse family of superantigens,” said Prof. Raymond Kaempfer. The Hebrew University’s Faculty of Medicine is a comprehensive training and research institution. Its mission is to educate Israel’s finest medical personnel and deliver biomedical research breakthroughs that alleviate human suffering and improve healthcare throughout the world. The Faculty encompasses five schools: in addition to the Hebrew University-Hadassah Medical School, the Schools of Pharmacy, Nursing, Occupational Therapy and the Braun School of Public Health and Community Medicine provide the training that enable graduates to deliver the highest standards of research and treatment in Israel and around the world. 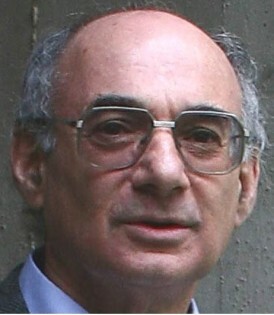 At two major Institutes, the Institute for Medical Research Israel-Canada (IMRIC) and the Institute of Drug Research, the Faculty of Medicine conducts fundamental and applied research essential to understanding and finding therapies for the illnesses that challenge medical science, among them cancer, cardiovascular disease, diabetes, neurodegenerative diseases, and infectious diseases. For more information, visit https://medicine.ekmd.huji.ac.il/En.